Although my specialty is not gardening, I am able to work in WeFarm’s business and operations “departments”. The reason that I have departments in quotations is because the size, age and culture of WeFarm does not accommodate for a strict break-up of responsibilities that is commonly seen in larger companies. Although I am their business intern, you can still find me working in the garden day in and day out alongside agricultural specialists. Now, off of what WeFarm is and onto what I have been doing! As WeFarm’s business intern, my responsibility is to assist with financial planning and accounting. Besides bookkeeping, my goal is to offer suggestions of how to increase our clientele, which in turn would increase revenue. Not only am I supposed to increase revenue, but I am also responsible for finding ways to cut costs. In the first few days on the job, my boss Seneca Kern told me that one way that we can cut costs is by avoiding buying mulch. Especially with our larger gardens and community gardens, we use tens of cubic yards of mulch around the garden beds for aesthetic and agricultural purposes (mulch slowly decomposes and introduces vital nutrients to the ground). Luckily, we have found that tree cutting companies need to pay recycling centers to drop off the wood that they cut. Luckily, after the wood cutters cut the tree, they shred the trees to small pieces that are just like mulch. These “wood cuttings” are free of chemicals that are used on regular mulch (which is in line with our belief in the importance of building organic gardens) and are free of cost! As a result, these past few weeks have been a lot of calling companies, asking for “wood cuttings” and building a network for the future. After some more time of working with WeFarm, I expect myself to find ways to further cut costs. These next few weeks, as they are the last few weeks of the “prime planting season” are going to be focused on reaching out to people and telling them more about gardening and more about the services WeFarm provides. More on that next week! 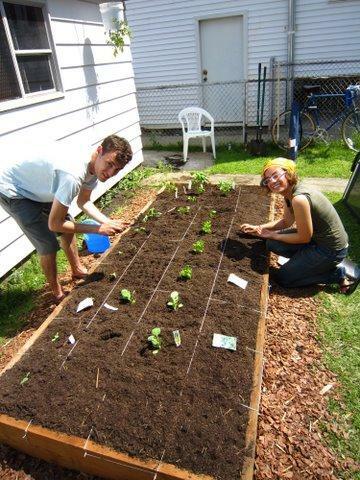 This entry was posted in Urban Agriculture and tagged WeFarm America on June 16, 2010 by Alex Kucher.